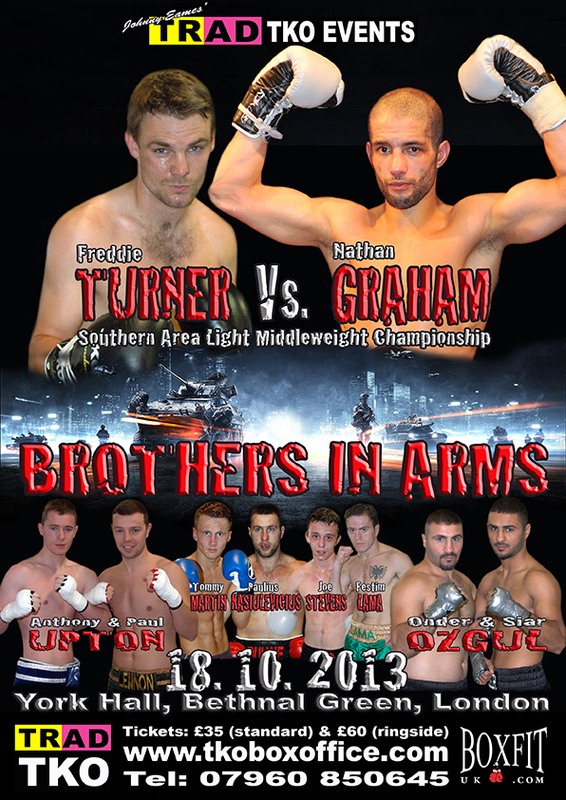 Canning Town’s Freddie Turner is set for his first taste of Championship boxing in just over a weeks time, when he challenges Southern Area Light Middleweight Champion Nathan Graham for his crown on the Johnny Eames TRAD TKO Events promoted BROTHERS IN ARMS event at York Hall on Friday 18th October 2013. A reinvigorated Turner has put in a couple of stunning performances since signing with renowned coach, manager and now promoter Johnny Eames, back in January. 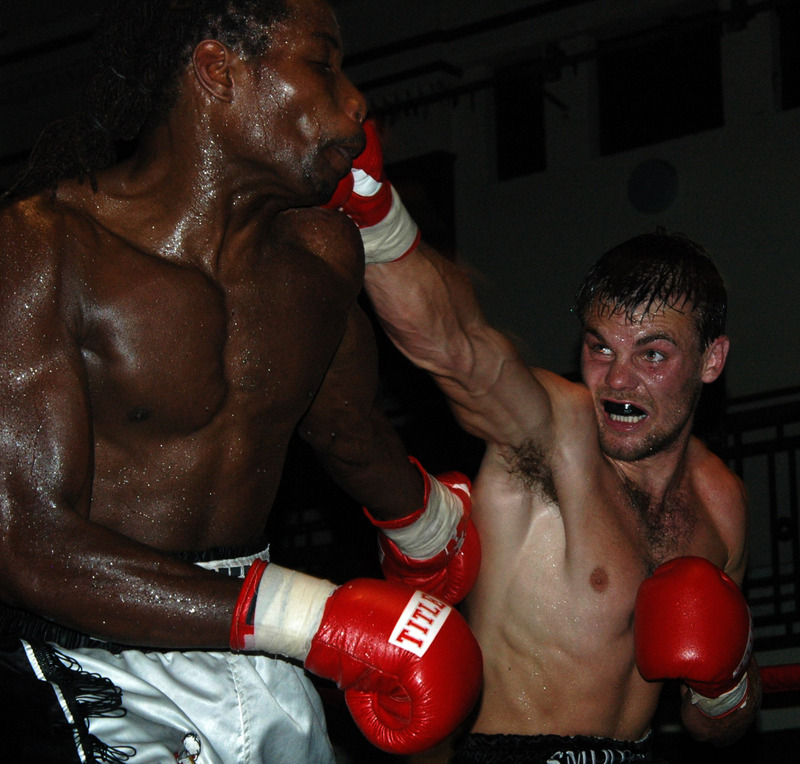 After fighting just the once in 2012, it was less than four weeks, from signing, that Turner made his first outing under the TRAD TKO banner, scoring a solid points win over Costas Osben in February. Next up Turner was supposed to fight on the undercard of Colin Lynes versus Beka Sutidze, but unfortunately due to illness had to withdraw. However he didn’t have to wait too long for his next outing, which came in July, on the TRAD TKO Events TURF WAR event, when he faced Birmingham’s Max ‘Mad Max’ Maxwell. After a cautious start against the former British Title challenger, Turner stepped up the pace to turn in one of the most sensational performances of his career, to score a locked out 60-54 points victory. It was after this near perfect performance, against Maxwell, that Johnny to bring the proposed title shot forward, no surprise really the East Londoner leapt at the chance to challenge Graham for his Southern Area title. Following a training session, with future Hall of Famer Jimmy Tibbs at the TRAD TKO Gym, Turner spoke briefly about the positive change in his career since joining Johnny, as well as the upcoming title shot. “Johnny said he’d get it, what can I say he done exactly what he said he’d do. I’ve not even been with Johnny a year and he’s done everything he said he’d do. I’ve had it before where people said they’d do things and they didn’t, Johnny’s done it, what can I say he’s got me more fights than he said he’d get me by now, he did say he’d get me a title shot and he’s done it, I can’t fault him at all, I’m really happy about everything. It’s improved my boxing, everybody’s been saying how good I’ve been looking, this is all due to I’m feeling good and I’m settled, as I have a plan and I’ve got a future. Before I didn’t know what I was doing, it was all over the place but now it’s going smooth, everything’s going perfect, I just cannot wait for the 18th, I really can’t. I’ve seen Nathan about, bits and bobs of his fights, before when I was a Welterweight I was looking at fighters in that division. I’m really tall for a Welter, I filled out over the past few months and started to grow into a man really. I’m punching hard, I’ve gone to Light Middle and I feel comfortable. He looks capable, he knows what he’s doing, he’s gone the distance a few times, I mean he’s the Champion, you don’t get that for being nothing. It’s going to be a good fight, I’m not into bad mouthing or slagging off, but I do believe that I’ll beat him and beat him well. It’s going to be a good fight, I hope he brings his best because I am. It’s for the fans that I do boxing, I’m an entertainer, I love to entertain and for the fans to come all the way to York Hall and spend their hard earned money, I know it’s tough but it makes it worth while, when it gets tough in there to hear the people you know shouting and screaming for you, it makes it all worth while. Nathan Graham versus Freddie Turner Southern Area Light Middleweight Title clash headlines the Johnny Eames TRAD TKO Events promoted ‘Brothers In Arms’ event at York Hall in Bethnal Green, London on Friday 18th October 2013.